According to Orbis research, the learning management system market was valued at 6.92 billion dollars in 2017. The value of this market is expected to rise to 23.12 billion dollars by 2023. 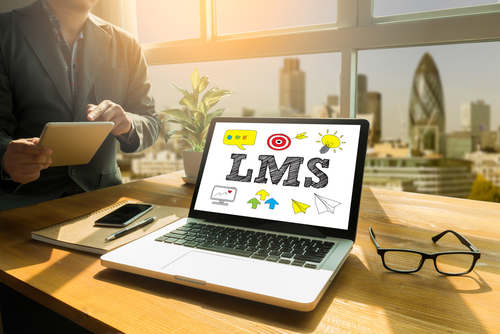 According to MarketsandMarkets (2019) There are several reasons why the LMS market is booming presently. More and more corporate and academic environments are favoring Bring Your Own Device (BYOD) policies and enterprise mobility with increased adoption of online learning. Government initiatives to businesses support the rise of LMS utilization. The advancement of Artificial Intelligence (AI), and Machine Learning (ML) in LMS platforms is contributing to the increased use and reliance on LMS technologies for training activities. Further, the learning and development market is worth over 180 billion dollars, and is the number one growth market in HR tech (Sierra-Cedar HR Systems Study, 2017). This means that more money is being invested into teaching technologies (such as LMSs) for employees at the global level. Within the LMS market, there is a niche market for LMSs that are designed for the healthcare industry. All of the information above also applies to the healthcare LMS market. Typically healthcare organizations invest money in a healthcare LMS solution to cost-effectively deliver mandated trainings to healthcare professionals. Healthcare LMS platforms keep track of continuing medical education credits of healthcare workers, and can connect to accrediting body databases that store credentialing information of healthcare professionals. With the continuing education market poised to more than double over the next 5 years, it is understandable why training directors are turning to healthcare LMS platforms to keep pace with these increasing credit requirements for workers in the healthcare industry (Orbis Research, 2018). There are hundreds of healthcare LMS options, and even more online healthcare continuing medical education courses available online for the delivery of CE credit necessary for license renewals. There are several reasons why healthcare LMS platforms are more optimal for delivering credits than in-person training mechanisms. Healthcare LMS platforms automate the certification process. Additionally, healthcare LMS platforms can be accessed on mobile, tablet, and desktop devices. This enables healthcare professionals to take CE courses and other mandatory trainings at their own pace anytime, and anywhere 24/7. In-person mandatory trainings and CE courses can be difficult to schedule given healthcare workers’ varying schedules. According to Sahoo (2017) Healthcare is approximately the fourth leading industry in the global learning management system market. By 2023, this industry will increase its use of LMS technology by approximately 200%. This healthcare LMS market growth reflects the hundreds of thousands of organizations seeking out a learning management system to meet their training goals. If you represent an organization looking for a healthcare LMS solution, look no further than the top 5 healthcare LMS platforms. CertCentral LMS for healthcare industry is a healthcare learning management system for creating scalable continuing education and certificate training programs. CertCentral supports large, medium, and small healthcare organizations. Some of these healthcare organizations specialize in pharmaceuticals, rehabilitation, allergy and immunology, and mental health services. CertCentral has an intuitive interface. You can quickly create multimedia trainings and deliver them online to various departments. Learners can also use the courses easily and quickly. Scoring settings automate the grading process. No longer must you waste time grading testing results. Set a minimum passing score so that individuals that meet or exceed that value will be automatically sent a custom completion certificate. Scoring settings that strengthen the rigor of your trainings include total-point scoring, percentage-based scoring, and weighted scoring options. Set up your custom completion certificates. Design each certificate to include the learner’s name, unique certificate ID, as well as the date of issuance, and course name. Additionally, add the logo for your healthcare organization, the name of your healthcare organization, and any custom text (e.g., number of CME credits, instructor name, and more). If you are looking to sell your CME courses to healthcare professionals outside of your healthcare organization, utilize CertCentral’s payment processor. Link your Stripe account with CertCentral and earn money from learners when they register for your healthcare trainings. CertCentral doesn’t offer premade healthcare courses. Custom branding–such as a custom URL and theme colors reflecting a healthcare organization’s theme colors–is only available in Enterprise Plans. Although CertCentral does not provide premade healthcare trainings, its software design is intuitive, and the platform overall is affordable. SAP litmos is a healthcare LMS that partners with managed care consortiums, an electronic health record systems company, and a faith-based health care system (one of which is named CHRISTUS health). Enforce HIPAA and OSHA training requirements with healthcare staff by creating courses in accordance with predefined standards, laws, and policies on SAP Litmos. SAP Litmos supports premade healthcare courses for easy download by subscribers for easy implementation with healthcare workers. SAP Litmos supports gamification to increase learner engagement with healthcare programs. For international audiences, this LMS platform might not be the best fit if sharing larger sized multimedia files. Buffering issues have been reported by international learners. Unlike CertCentral, reporting features on SAP Litmos are less robust. If you are looking for a Healthcare LMS that offers pre-made courses and have a budget to support this higher-cost LMS, SAP Litmos is a wonderful choice. Choosing a learning management system (LMS) for your healthcare organization is an incredibly important choice. Be sure to choose one that works best for your needs.